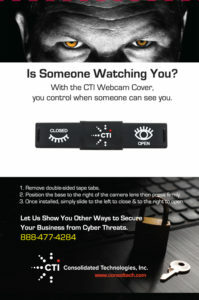 Webcam Offer : Consolidated Technologies, Inc. The webcam cover easily fits over any laptop/monitor camera, alerting you to when your camera is viewable to others. So fill out the short three-question survey below and we’ll contact you if you are one of our monthly winners. *Only available to addresses in the continental U.S.